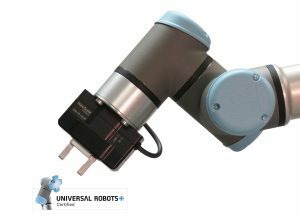 New Scale Robotics, a division of New Scale Technologies, has received Universal Robots (UR) certification for its NSR-PG-10-20-UR Precision Parallel Gripper. Universal Robots certification confirms that the smart gripper is fully compatible with UR collaborative robots and meets all published specifications. At 175 grams, it the lightest and smallest electric parallel gripper available for UR robots. It installs with one connection to the tool I/O port; no external cables needed. Finger positions are teachable: Manually move fingers to the desired positions and set them using the UR teach pendant. Factory-installed fingers are easily removed, exchanged and modified to suit a variety of part shapes. The gripper can be quickly taught and re-taught using the URCaps application included with the gripper, and UR Polyscope scripts that control the robot. The NSR-PG-10-20-UR gripper finger stroke is 20 mm for high flexibility in agile manufacturing environments. The gripper can measure part size with 30 micrometer precision. The maximum recommended part mass is 100 grams. The NSR-PG-10-20 is available through all Universal Robot sales offices and distributors. It is also available directly from New Scale Robotics at an introductory price of $3,600. Call +1 (585) 924-4450 or email NSTsales@newscaletech.com.